I am a word lover! I would have said I’m a book lover, but over the years how my world has changed. I’ve grown from an avid reader of the physical book (still my favourite form, I have to add!) to loving my Sony eReader which allows me to read six books on holiday without paying the dreaded penalty of luggage charges, as I cram books into my suitcase. But I then became a writer – if I thought I loved words as a reader – I love them even more as a writer. Finding just the right word to portray the image I’m compelled to create brings back memories of my dad, cup of tea in hand each evening, as he sat with his daily crossword fix. But how exactly does this all lead on to Toastmasters? Well, I don’t know whether you agree – and would love you to let me know either way – but early in my writing career, I realised that how you deliver your writing to the wider audience is every bit as important as the way you write it. Never having trouble reading in class as a child, I suddenly found myself becoming tongue-tied and emotional as I read aloud memoir pieces in my creative writing class. My throat would dry up and my heart thunder in my ears. It may be a good thing to ‘feel the moment‘ in what you’ve created, but it dawned on me then, that as a writer you bare your very soul to the world. You feel that anyone listening to you read is judging you not only on your writing, but also on your delivery. Although I’m still going to buy their books, I have occasionally come away from a book launch just a little disappointed if my favourite writer has mumbled their way through their reading. On the other hand, I have often listened to writers read so beautifully, that even though I might not have been a fan of their genre, I have purchased their book. I considered a quick-fix and scoured the internet. I found various sites on public speaking courses and even psychotherapy – which I considered enough to send off an enquiry email. 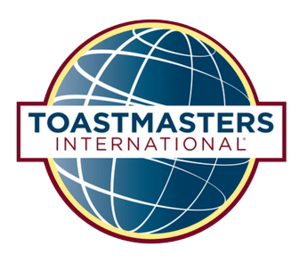 A couple of friends mentioned Toastmasters (even though they didn’t know much about it) and the name popped up favourably, again and again in forums – so I decided to give it a try. I rang the President of Clondalkin Toastmasters, who was friendly and encouraging and informed me that it was free to attend the first couple of meetings to see what I thought. I still hadn’t a clue what to expect that first night, but if I told you I’m in my second year and currently hold the title of Vice President Public Relations, I’m sure you’d figure out that I enjoyed it and found Toastmasters did exactly what it said on the tin! It is and it does. Toastmasters hold meetings all over the world. Their members are from all walks-of-life; young, old, rich, poor, confident and shy, but all with one goal – to become better public speakers. And believe me, it works. Every meeting is an enjoyable night as you partake or listen to speeches or tall tales; a poem or a joke, give your feed-back and enjoy the laughter and banter over a cuppa at the break. It is the most encouraging environment you could imagine where you learn from watching others and put these tips into practice in your own speeches. The ‘pause’ is one I have yet to master – it adds so much to a speech – I’ll keep practicing . . .
At any stage in our lives – be it weddings, funerals, meetings or book launches – the ability to stand up in front of a crowd and speak is one we should all strive to master. Or are you already a fellow Toastmasters who would care to share?